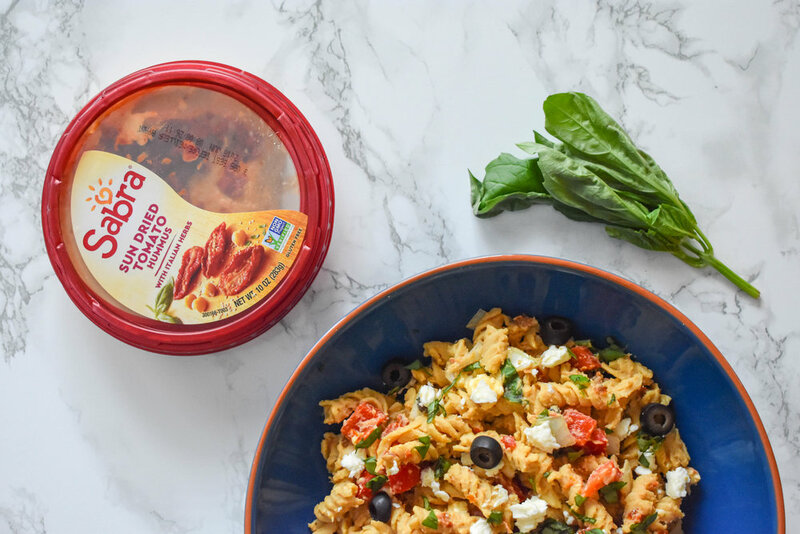 If this post last year didn't convince you that the Weirs are huge Sabra hummus fans, I'm here to once again convince you of our commitment to the savory dip. The biggest discussion in our household is what vehicle we prefer to aid us in actually eating the hummus. While Andy loves pita chips and veggies, I love finding new and different ways to eat our hummus. Hummus is the perfect snack (or in this case ingredient) to add to your day. There are plenty of flavor options these days and we're huge fans of the supremely spicy and jalapeno. My biggest issue when I did Whole 30 in January was that they don't allow garbanzo beans, and hummus by extension. While I wanted to follow the Whole 30 rules, I know I don't have any issue with beans. Hummus is a great source of plant-based protein and I hated that I didn't have hummus as a snack option for the month. We were quick to re-stock on hummus once our 30 days were up. 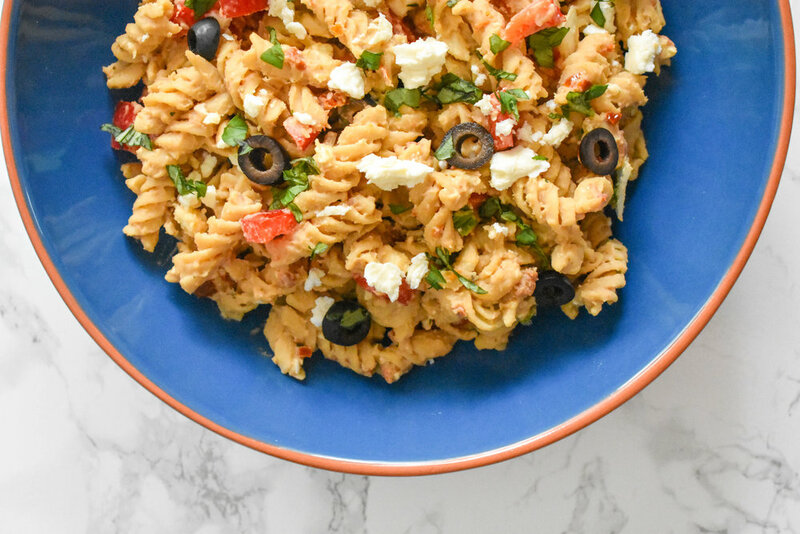 This hummus Greek pasta salad is full of tasty savory flavors. It would be the perfect side dish for your spring/summer BBQs and is tasty whether served hot or cold. 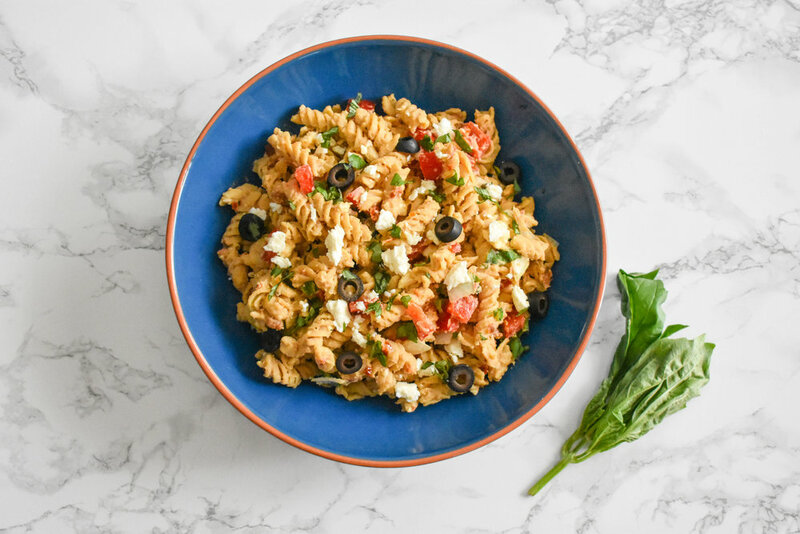 The hummus isn't overpowering for the dish, but gives the recipe a delicious twist on your typical summer pasta salad. Cook your pasta, following the instructions on the package. When your pasta is cooked, drain the excess water and return to the pot it was cooked in. Stir in the tub of Sabra hummus to coat all of the pasta. Add in the remaining ingredients, stirring to evenly distribute. Top the dish with additional fresh basil.